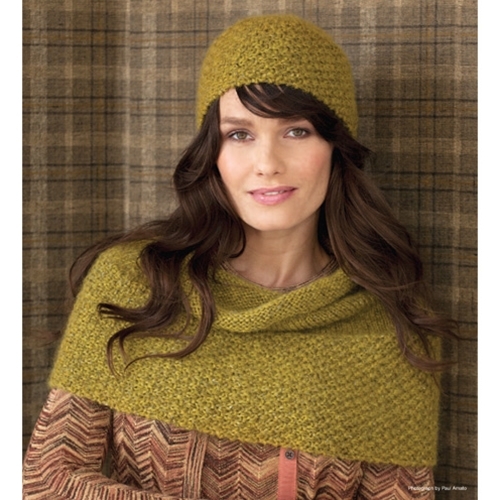 Double seed stitch lends rich texture to this cowl and hat duo. The double-seed-stitch sections are worked flat and then seamed; the stockinette sections that form the cowl and the top of the hat are picked up and knit in the round. The custom fabric is created by knitting with one strand of each yarn held together throughout. 16 sts and 18 rows to 4"/10cm over double seed st using size 10 (6mm) and one strand each of A and B held tog. Sized for Small, Medium, Large, X-Large. Shown in size Small. 116 sts and 18 rows to 4"/10cm over double seed st using size 10 (6mm) and one strand each of A and B held tog.